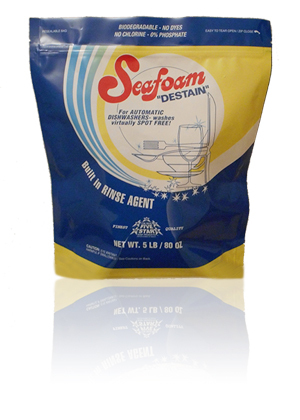 The finest quality dishwashing products manufactured in America today. Super-concentrated for complete soil removal and spot-free rinsing of all dishes, silverware, utensils, pots and pans, in any make or model dishwashing machine. Contains the correct scientific blend of natural silicates, grease emulsifier, and anhydrous penetrants, to dissolve all food stains, grease and soil, virtually eliminating spots, streaks, and film. Use very sparingly. Place one to two teaspoons of ‘Destain’ in each dispenser or bottom of machine if it has no dispenser. Do not pour over glasses, dishes or silverware. If results are not completely satisfactory, increase measure depending on size and make of machine and degree of soil to be cleaned. If machine is not operating properly or efficiently, call your dishwasher service man. For tough to clean cookware, presoak in solution of 1 tablespoon per 1 quart of hot water. Do not presoak silver items or cast iron pots. Cal Ben's award winning array of ‘Five Star’ earth friendly ‘Pure Soap Products’ are recognized as environmentally safe (biodegrades quickly and completely.) formulated from the purest grade natural ingredients to produce magnificent soaps of the highest quality for performance beyond your expectations.